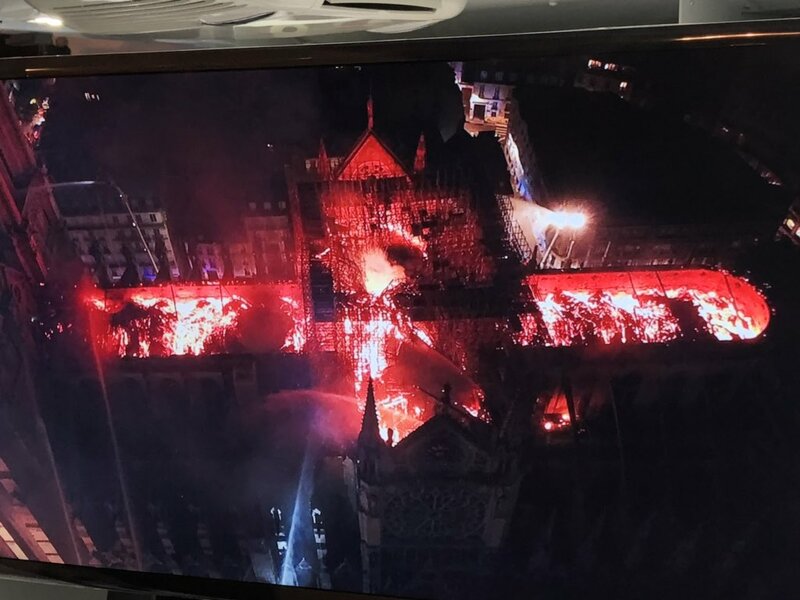 Notre-Dame de Paris - cathedral on fire! I was going to suggest it will be blamed on immigrants. At least by Trump. The remarks they showed by Trump, who is at some event in Minnesota, were actually surprisingly respectful and well-measured. York was caused by a lightning strike. Not according to a relative of mine who was working for the independent fire investigators who looked into it at the time. The actual more likely cause couldn't be proved, so the far less likely "lightning strike" theory was allowed to stand. He knows more about firefighting than anyone, right? God, the man is a moron. Water tankers are great for fighing wildfires, but a building fire..not so much. So it was a lightning strike. How do you pronounce the capital of France? Paris or Paree (the latter with a rolled 'r')? French rolled, not Russian rolled. French rolled Rs are done with the back of the throat rather than the front of the tongue. I'm going to sound like an asshat but I would've traded a few lives to keep this priceless, timeless artpiece. Generations have looked to this building as an important piece of history. Would you be prepared for your life to be one of them? If not, you probably shouldn’t be saying things like that. I’ll admit that I had a similar thought but in such situations I always ask myself if I would volunteer to be part of the price. That’s usually enough to rein in my thoughts. I think it's the difference between "No-tra Dayme" and "Not-ra Daame." Why not? What does one have to do with the other? Whether I would trade my life has no bearing on the general point that I consider these historic monuments to be worth more than a few people who, including myself, will not be remembered in a few years time, and who are easy to replace. But to answer your question: yes. Just read Obama's tweet. His heart is in the right place but you can't rebuild nearly a thousand years of history. On the BBC, they are citing officials of the fire department expressing the expectation that they will be able to save the main structure, and to get a handle on the fire within 2 to 3 hours. Just heard that one firefighter has been seriously injured. They need to back off. It's not worth a life. I’ve been to Paris several times and have found Parisians not at all horrible. If you try to use a few French words (and you should greet people in the local language wherever you are) you are treated pretty well. I second this. I’ve been there as a tourist several times and never experienced anything but friendliness. My theory is that, waiters, in particular, appreciate my attempts to use their language but my accent probably sounds like dragging your nails down a blackboard to them, so they switch to English. The chief of the Paris fire brigade, Jean-Claude Gallet, just said that the main structure of Notre Dame and its two towers are saved. Two-third of the roof has been destroyed but the fire seems over or at least under control now. Last edited by Castro; 15th April 2019 at 02:06 PM. I don't know for sure, but I'm guessing there have been a few fires there previously, and various parts have been rebuilt before. Why does every world event have to end up being twisted to have some Trump element? Because he Tweeted about it and managed to be an idiot as usual. It is actually more the rule than the exception that the substance of the very old historic (medieval or older) structures of Europe is mostly rather young - reconstructions, replacement or modern additions. Just take the spire that collapsed today: It was actually only built of oak wood in the 19th century. Take the gothic cathedral in Cologne, Germany's most visited landmark, construction of which began in 1248: Its famous towers, at more than 157 meters the tallest buildings in the world until 1884, rose above roof level only after 1842 and were completed in 1880. The crumbling stone of the facade has been renovated so often and so much that I doubt much of what you see today originated before 1322, when the cathedral was consecrated. Fires and wars have laid ruin to many monuments that have subsequently been rebuilt - and many are billed as "medieval" or somesuch. Last edited by Oystein; 15th April 2019 at 02:07 PM. No, it is not. It is a building. Never call the waiter “garçon”. As a rule, they don’t like being called “boy” any more than waiters in your country would. Dramatic picture of the scene, supposedly from a police drone. At least it confirms what I hoped for, namely that the masonry (I guess?) vaults were able to withstand the heat and let the wooden structure burn on top of it. It's going to need some careful handling in the coming hours and days, but hopefully the worst of it is over. This was almost 30 years ago. I cannot know today if I said "garcon". I probably did not, and if I did, I suffered no negative consequences. What a couple of others said before: It has been my experience in Paris, and elsewhere in France, that if you try to speak their language, but fail, they'll be happy to come to your rescue with whatever German or English they know. I thought it was pretty obvious. It’s one thing to be prepared to give your life for a cause, it’s another thing entirely to be prepared to give other people’s lives for a cause. Notre Dame might be worth more than a few people’s lives in general terms. Indeed, probably a few people died during its construction, but my life is worth more to me than any human made inanimate object. There are other cathedrals and Notre Dame itself could be rebuilt. I’ve only got one life. In the case of the cathedral in Cologne, it's that Master Gerhard, the first master mason, made a bet with the Devil that resulted in that it is cursed never to be finished. Myth aside, the reason it was 'finished' that late is because they ran out of money until people decided it's worthwhile to raise money for it. Notre Dame was similar in that as it was in major disrepair after the revolution, and in fact Victor Hugo's Hunchback was quite influential to raise the money for its rebuilding. I put 'finishing' in quotations above, since it's my understanding that all buildings of that size and age need constant maintenance, rebuilding, and replacement. They are never set in stone, so to speak, but are living entities. The cathedral in Cologne has it worse in that regard as it has one of Germany's largest railway stations as its immediate neighbor. There's scaffolding attached to one of the towers, and from what I know it's unlikely to be ever without that scaffolding. It will just move about the structure to another area in need of maintenance. One of the good things of all of that is that in almost all the major landmark buildings there is extensive documentation. I know that the original plans for the cathedral of Cologne and Notre Dame are preserved, digitized, and backed-up. I know that Notre Dame, like the cathedral in Aachen, has just been extensively digitally scanned. Which means that it can be rebuilt with very little visible changes, if there's a will and money. Which is different like other disasters like the collapse of the Historical Archives of Cologne in 2009, where documents were irretrievably lost. Last edited by elgarak; 15th April 2019 at 02:38 PM. It's a French thing to dislike Parisians, something you can pick up. Something to do with the mythos of la France profonde. Besides, motive is relative during financial transactions, you have to get to know them to get irritated. That's all they are, irritating. You have to bust your chops in the daily commute, train or car, then you become irritating yourself. I'm surprised people aren't strangled every day in traffic on the ******* ring road. Yeah, so Parisians. Irritating. Any other questions? I gotta train now, so move it. Didn't the priests at the cathedral pray to their god to stop the fire? If my neighbor can pray that his mother's excema gets cured, and it worked, surely the fire would have been stopped. Oh, I forgot, God works in mysterious ways. Sorry to go all angry atheist there, but, seriously, I fully appreciate that one of the greatest landmarks of Western civilization is at peril. Would you accept if I told you that a human is just a meatsack? It's not just a building. Would you say that about the Pyramids? It's part of our collective history. It's not, and your explanation does not clarify matters. Notre Dame might be worth more than a few people’s lives in general terms. Indeed, probably a few people died during its construction, but my life is worth more to me than any human made inanimate object. How do you calculate worth? I mean, after you die, and after I die, probably nobody will speak of us just a few years later. There are other cathedrals and Notre Dame itself could be rebuilt. I’ve only got one life. And yet plenty of other humans can take your place. A new cathedral would not have this one's history. A lot of the artwork within Notre Dame is considered a national treasure;the firemen are wlling to risk their lives to save as much of it as possible. There are people for whom history and culture mean nothing. The Fire/Aviation people at the Government Agency I worked for rolled their eyes in disgust at the ignorance of DOnnie's Tanker suggestion. Last edited by Sideroxylon; 15th April 2019 at 03:34 PM. Thing is, a LOT of people die every day, some in horrible circumstances, and I'm sure Steve doesn't lose much sleep over it. This is different. They mean something, but some people make a fetish of them. It takes a certain kind of conservative, to get mad at people who don't want to trade human lives to preserve a building. A lot of firefighters where I work risk their lives several time a year to save forests and other natural resources. Seems to be trying to save a work of art is in the same categoty. All of these old structures are Ships of Theseus, aren't they? When they rebuild this, can we really say this is still a medieval structure? This fire is now also part of the history of the cathedral. We don't like it happened but can only go forward from now, it will be repaired. The big quakes in Mexico recently destroyed many churches, some were built as early as the 1500's. A year or so later many are repaired and the new bell tower looks just like the old one but won't fall in the next quake. All are historical monuments and given time most will be back to glory. A few were seriously structurally damaged and are just shored up for now until a solution is found. The losses are the art inside and the big windows. Once lost a recreation just isn't the same. I have seen some here that are just amazing. I visited a few old churches for the art and architecture. I never knew stacked rocks could be so artistic. I don't begrudge those who choose to fight for it. Just as I don't begrudge those who decide it isn't worth it. You, on the other hand, seem to be holding a serious grudge here. I believe that there are buildings and other key cultural objects that are worth the risk of human life. These are core parts of our culture that help give us inspiration, join us to society and to other people, and help define important parts of our emotional and intellectual lives. In many ways they help make us human. But the risks should be borne only by those knowledgeable and willing to take them. There is a very good (IMO) and relevant science fiction story, Fire Watch by Connie Willis, about St. Paul's Cathedral in London during the Nazi blitz. I believe it is available as a PDF on the Internet; whether legally or not I do not know so apply appropriate ethics if you seek it that way. I believe that there are buildings and other key cultural objects that are worth the risk of human life. These are core parts of our culture that help give us inspiration, join us to society and to other people, and help define important parts of our emotional and intellectual lives. In many ways they help make us human. But the risks should be borne only by those knowledgeable and willing to take them. You can subscribe to all of that, without thinking it justifies sending other people to die for the things you prize so highly; and without thinking you're entitled to be butthurt if others choose not to risk their lives for this purpose. Dudalb isn't expresssing gratitude for those who share his feelings. He's expressing anger at those who do not.